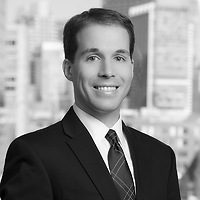 At the Annual Meeting of the Boston Patent Law Association (BPLA) held on December 7, 2016, Rory P. Pheiffer, a partner in Nutter’s Intellectual Property Department, was elected to the position of President-Elect. Rory will now be appointed the President of the organization for a one year term starting in December 2017. In the interim, as President-Elect, Rory oversees the 25 committees of the BPLA, ensuring that each committee provides quality and useful meetings, programs, and events for the BPLA membership in furtherance of the BPLA’s goal to provide educational programs and a forum for the interchange of ideas and information concerning patent, trademark, and copyright laws. Rory just finished a year serving as Vice President of the BPLA and as Editor-in-Chief of the quarterly BPLA newsletter. This is Rory’s sixth consecutive year being elected to a position on the BPLA Board of Governors. He previously served as the BPLA’s Treasurer, Secretary, and two years as a Board Member. He also co-chaired the New Lawyers and Law Students committee for one year, and the Invented Here! committee for the past seven years.